I've been wearing this outfit a lot over the past few days because I recently bought these high-waisted floral shorts from Forever New and they are the most comfortable thing ever! Oh yes, and please say hello to my brand new Miu Miu mini bow bag. The day I took these photos is the first time I've taken it outside; I'm terrified something's going to happen to it! As you can see, I made a very attention-seeking friend while I was taking photos outside. She's the most affectionate cat I've ever met and is constantly trying to get into my apartment, curl herself around the legs of my tripod, and meows constantly unless someone strokes her. 40 comments | Mini bow bag! 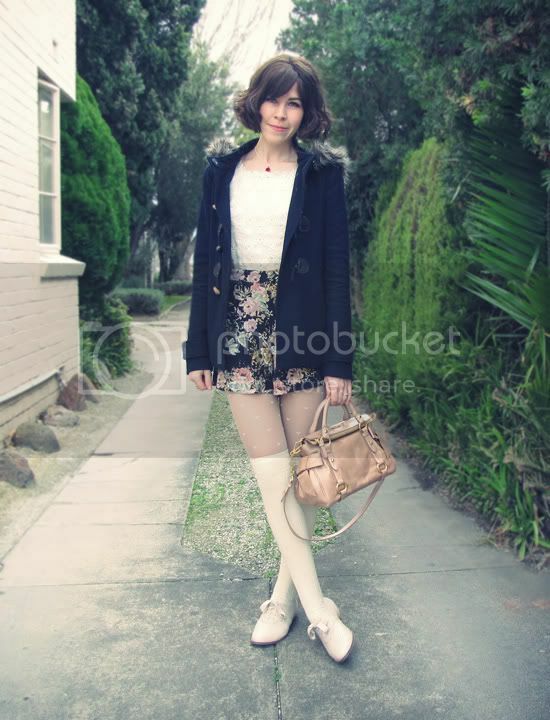 This outfit is so feminine and pretty! SO jealous of your bag. you have a great blog! please check out my blog and follow if you like, I promise to do the same for you! Oh, this is a cute outfit. Love everything. And woukd have never guessed they were shorts. You hair looks gorgeous too ... awww, & how can you not love a cute kitty. Love the Miu miu bag! I want one in black or tan! Great outfit! 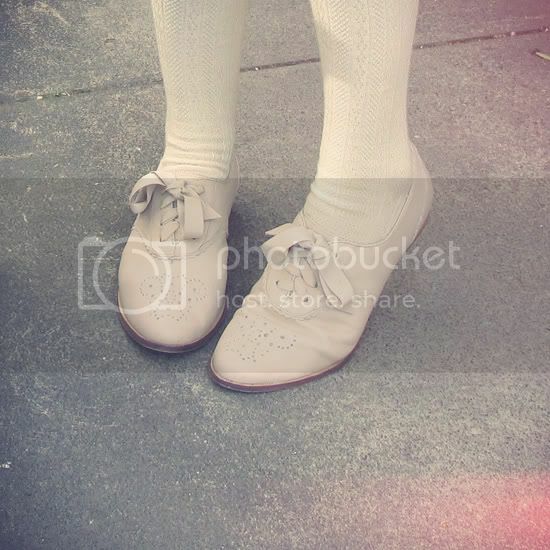 Love the socks and tights. 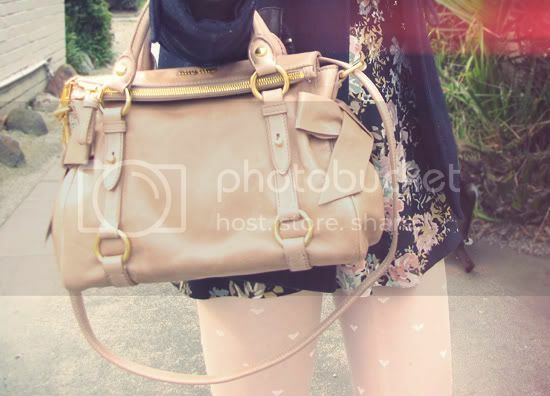 lovely outfit and your new bag is simply amazing! so adorable! my mom has the large version and wears it to DEATH. it is such a classic staple bag. 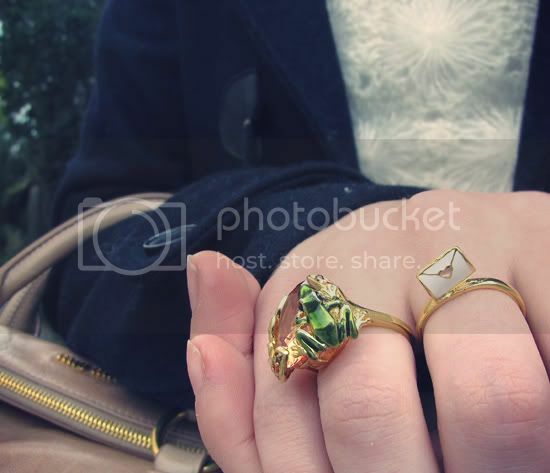 Sushi, I'm so flattered you're wearing the Lucid New York frog cocktail ring! And your new Miu Miu bag looks stunning. Great choice! you're outfit is so cute as usual! you find the best things at forever new. i would seriously be nervous taking out my new bag too. especially since its a light color. Very cute outfit! I love the bag and shorts! Our neighbour's cat is like that too, always at our house wanting some attention. I love the Miu Miu bow bag, dreaming of owning one myself in the regular size one day. I would be scared of taking out a new designer bag too. You should waterproof it to protect it from water and stains. Your blouse is so cute. And your shoes also. can we see more of the cute pussycat? I love the outfit! The accessories are fantastic! Very jealous, I want a Miu Miu bag so badly! Anonymous - If she decides to join me when I take pictures outside next, then sure! so cute! 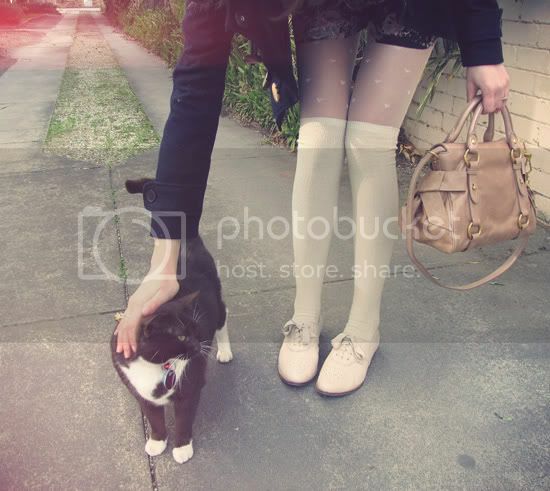 amazing photos, and of course love the miu bag! the color is sooo soft, goes like with everything! 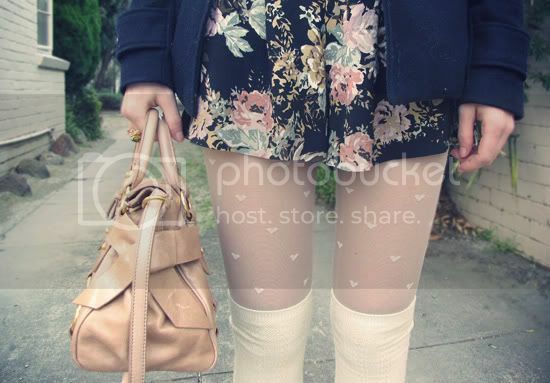 And what can i say about this outfit: i'm in love with the shoes, tights, bag, rings. Adorable! Love this back to the fifties look! Happy sunday! there isn't one thing about this post that isn't adorable. That’s pretty cool. I really enjoyed to reading your blog.. I love the colour of your bags! 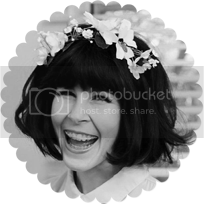 Your blog looking is attrective and beautiful. i will certainly take a look at the new blog! That’s wonderful looking of your post! cute outfit! Love your bag! I like that. Thanks for nice post!